We would like to congratulate Mark Wooddell of Pawnee, IL. 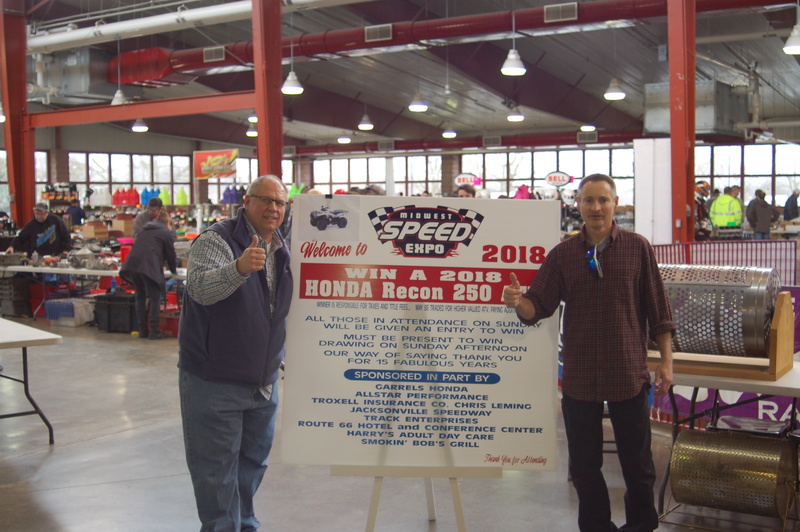 who was the winner of the 2018 Honda Recon 250 ATV at yesterdays 15th Annual Midwest Speed Expo! First name drawn was Kristina Goodall but she had already left the show, second name drawn was “believe it or not”, my Son-in-law Devin Gilman, I disqualified him because he is family and everyone would have sworn it was fixed! (He isn’t so happy about that, hope that’s the only time he regrets being related to me), finally, third time was a charm for Mark Wooddell as his name was drawn. 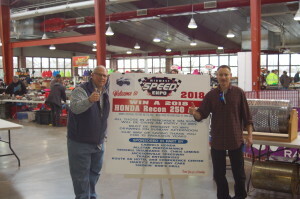 Mark was ecstatic, and said he has never won anything, this is exactly what I had hoped for when we set out to givbe away this ATV to commemorate our 15th year and say THANK YOU to those who have supported our event! Thanks to all of you who have supported the MIDWEST SPEED EXPO, you are all winners with us! 2017 Driver of the Year Annnounced at Expo!